Ben pulls out a blackened drawknife; the first woodworking tool he ever bought, from a fair in the countryside where he exhibited with his mentor. Holding it, I could imagine the blade glowing orange as an old blacksmith forged it to a point on an anvil in his workshop back in the day. 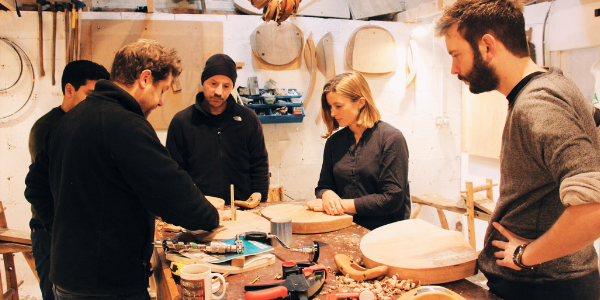 An insight into Ben’s London Studio The methods Ben uses in his South London workshop date back to the origins of carpentry, in the days before big machines. It’s called ‘green woodworking’ because they work with hand tools and unseasoned wood – the only processing these trees have seen is being cut down and chopped into logs. A lot of artisanal crafts like this died out with the two world wars, but they’ve seen a revival since the 70s with the hippie movement taking us back to the land and our roots. Demonstrating what he teaches, Ben takes a log of ash that still looks dewy on the bark and splits it in half, then into quarters and eighths with a froe and wooden hammer. ‘There’s an element of strength’ Ben reassures me, ‘but it’s more technique.’ He chops away at one of the pieces with an axe until he’s holding a messy cylinder, then moves over to the next work station – a wooden shaving horse – and scrapes off the rough edges with that ancient drawknife. 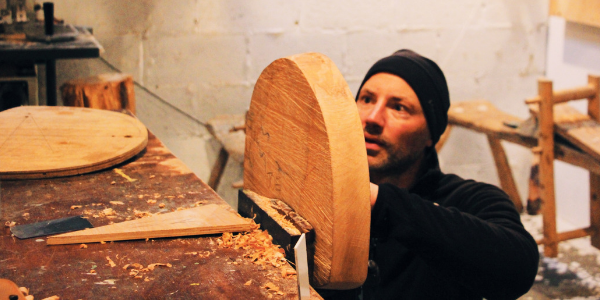 The first time he went, it was to study the art of chair-making under the tutelage of Mike Abbott, the resurgent of the green woodworking craft. 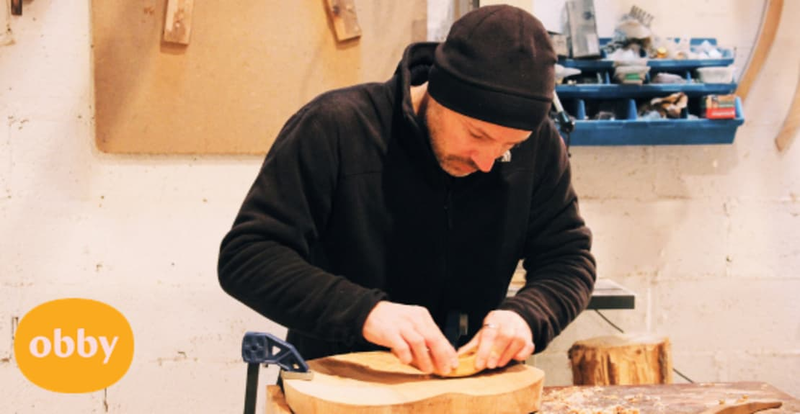 His dedication during the course scored Ben a place as Mike’s apprentice for the following season, where he took on the role of assistant teacher and began to share his learnings with other keen woodworkers. From student to teacher Though teaching is in his genes, with his mum a school teacher, Ben was a little intimidated by the fact that some of the students had been practicing longer than he had. But – as many of our teachers have experienced – a shift from learning to teaching forced him to realise his capabilities, and at that point, it became an immensely satisfying experience. We went on to speak for some time about how liberating it is to get stuck into hands on creative activities, in a time when we’re so often desk-bound and committed to work that’s fundamentally unfulfilling. Ben joked that getting into woodwork has complicated his life somewhat, because it means he’ll never be satisfied with a boring office job again. But I get the impression he wouldn’t change a thing if he had the option to do his life over without the complication. You really do notice a shift in mindset, when you get to bring more practical skills into a primarily digital lifestyle. It helps you to understand how the world around you works. Which is why our community of teachers is so passionate about helping people uncover their hidden talents. As we came to the end of our chat, Ben used wood shavings to polish off the ash spurtle that had been a big, chunky log when I’d walked into the workshop an hour earlier. He told me it’s quite a meditative activity, woodworking, because the process so rhythmical. ‘You’re very focused on something so small. It takes you out of yourself.’ And that was obvious in watching him work, honing your passion takes you out of yourself, and puts you into your element.